What Is Pro Forma in eTariff? According to FERC’s eTariff implementation guide, Pro Forma proposals submit a tariff record without invoking statutory processing timelines. Pro Forma tariff records cannot be converted to effective tariff records by FERC, and should be resubmitted as actual tariff records. In other words, a Pro Forma submission is a way of gaining preliminary feedback from the commission on contemplated tariff changes. 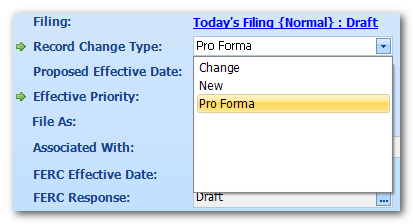 …to change the Record Change Type to “Pro Forma”, as shown below. In TariffShark, all FTRVs start with a “Draft” FERC Response. Once a Filing has been submitted to FERC, all of its FTRVs become “Pending”. So, the first two stages of a Pro Forma FTRV’s life cycle are “Draft” and “Pending”, which is the same as any other FTRV. However, that is where the similarities end. Because a Pro Forma submission does not represent a true proposal before the commission, many of the typical FTRV FERC Response values (such as “Approved” and “Rejected”) do not apply. So that Pro Forma FTRVs do not end their life cycle as “Pending”, TariffShark provides a FERC Response of “Pro Forma Ordered”. This FERC Response represents the end of the life cycle for Pro Forma submissions. NOTE: If the changes proposed in a Pro Forma submission need to become part of an official tariff, the changes must be resubmitted in a new Filing with a Record Change Type of “Change”. If you have questions about Pro Forma eTariff requests, we’d love to hear from you. Please comment below or contact TariffShark Support.